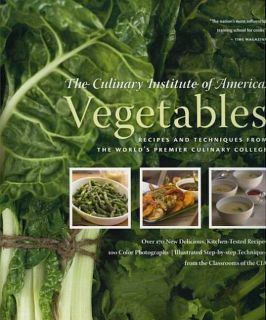 In May 2007, the Culinary Institute of America released a new cookbook focused entirely on vegetables. Fittingly titled Vegetables, this latest release from the CIA is (as expected) more than just a collection of recipes. The book starts with an overview of vegetables, nutrition, storage, and preparation techniques before diving into the well written, easy to follow recipes. If you're a vegetarian looking for well written recipes or a meat lover who's looking for some variety, you're going to love Vegetables. The book starts off with a 28 page primer on vegetables which does a good job covering the topics of how to select vegetables, what the common vegetables look like and taste like, how to store, wash, peel, and cut them, and, of course, how to cook (boil, steam, microwave, roast, bake, sauté, stir fry, pan fry, deep fry, grill, broil, stew, braise, and puree) and reheat vegetables. This section could be improved by adding illustrations or photos of each vegetable variety (four illustrations are included of four different vegetables out of close to sixty described; several interesting reproductions of old produce labels and advertisements are also interspersed among these pages). In addition, the discussion on cutting and chopping vegetables could also be improved through the inclusion of diagrams or photographs even if it would have been a massive reprint from The Professional Chef's Knife Kit. Even so, this primer is pretty good, reads easily, and will be a helpful read or refresher for anyone. 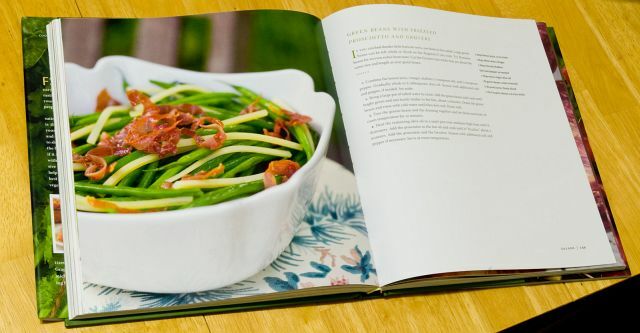 Vegetables then progresses onto the main section - 256 pages containing 170 recipes divided into the following sections: Soups, Appetizers, Salads, Entrees, Side Dishes, and Sauces & Relishes. Each section not only contains recipes but starts with a discussion on method and theory to help the reader understand the basic techniques of producing, let's say, a hearty soup or a stuffed vegetable. Focus pages on various topics such as vinaigrettes, mayonnaise, and specific vegetables can be found scattered throughout the book as well. 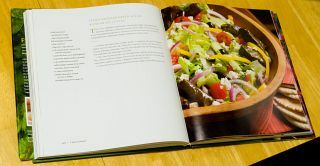 Although most of the recipes do not have photographs, many of them do and they are beautiful full bleed, full page photos. Other pages include illustrations of particular vegetables (related to the specific recipe). The pages themselves are on heavy stock, high contrast paper securely sewn through the fold allowing the pages to lie flat. By grasping just one page, I was able to hold up the weight of the book without a problem. The recipes that I've tried have produced tasty results and have generally been very easy to follow. Earlier this year, I wrote up my positive experience with Vegetables' version of Ratatouille. One last thing to note is that although not all the recipes are vegetarian, it should be fairly easy for most home cooks to modify them to be truly vegetarian. Vegetables is available only in Hardback. Be the first to comment on Vegetables (The Culinary Institute of America)!